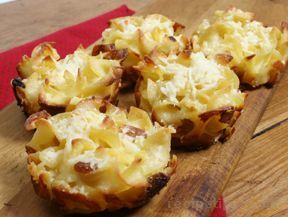 Unique pasta popover that is golden brown and crispy on the outside and creamy on the inside. This pasta recipe makes a great side dish for many meals. Try serving it with a burger instead of fries, your family will love the change. In a medium bowl, combine sour cream, melted butter, cream cheese, eggs, sugar and lemon juice. Whisk lightly with a whisk or fork. Cover and refrigerate overnight if possible or at least 2 hours. Add 1 teaspoon of oil to a large pot of boiling, salted water. Add noodles and cook until al denté. Drain and toss with the 1 tablespoon of butter. Cover and refrigerate overnight if desired. Generously grease or butter the cups of a 12 cup popover pan or muffin tin. Set aside. After refrigeration, fold the egg noodles into the cold egg mixture and combine well. Add cheese and mix to combine. Fill cups with noodle mixture. Bake until golden brown (40-45 minutes). Sprinkle with grated parmesan cheese and serve.